Goldstream is the perfect name for this little beauty of a thyme. Like flecks of gold lying at the bottom of a stream that beckoned to gold-panners, this thyme also invites closer inspection. Goldstream Thyme makes a very nice tightly knit ground cover that releases a pleasant lemon scent when walked on. Although it is lovely to look at, and lemony to smell, the lemon fragrance does not translate to lemony taste. 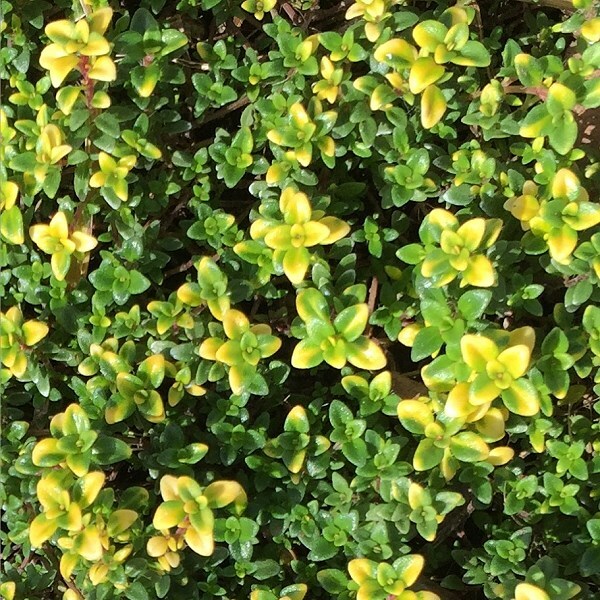 Goldstream Thyme is often included in our 36 Pack Alternative Lawn Assortments. This plant is often available in plug trays. These trays hold 128 of all the same plant. They are a great low cost way to fill a lot of space. Each cell is 3/4 of inch by an inch. Check here to see if Goldstream Thyme Plug Trays are available..